News broke Monday evening that the Marlins signed starting pitcher Edinson Volquez, a 2008 All-Star, to a two-year deal worth $22 million. Volquez has a 4.44 career ERA and pitched the last two seasons with the Kansas City Royals. Miami is in desperate need of starting pitching help, so adding a veteran rotation anchor was a must this offseason. The Marlins, though, have a track record of signing veteran mid-line starters in the offseason and promoting the signing on the basis that Marlins Park is undeniably favorable for pitchers–which it is–but getting largely underwhelming results during the season. To name a few: Mat Latos, Dan Haren, Wei-Yin Chen, and Edwin Jackson. 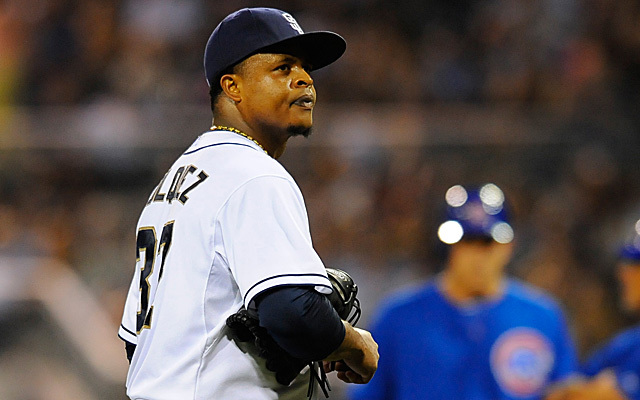 On a personal note, the one time I saw Edinson Volquez pitch in person was in San Diego in 2012 when he nearly spun the Padre franchise’s first ever no-hitter. He threw a one-hit shutout in a win over the Astros. You can read all about my adventures in San Diego by clicking on the linked words above.